Today, there are thousands of women on Active Duty who enlisted from or are stationed in the State of Arizona. In addition, more than 59,000 women veterans now live in Arizona. The increase in the number of women serving in the military over the past few years has increased the need for supportive and specialized services for military and veteran women. 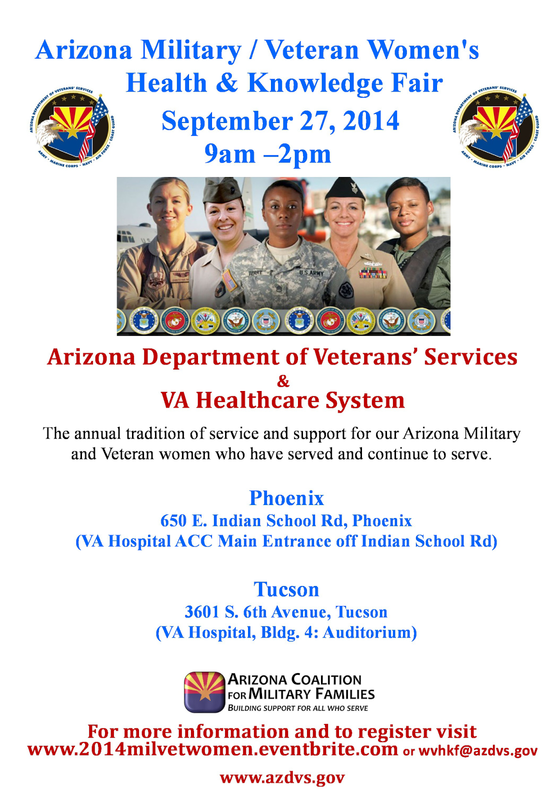 To help meet the needs of these women, the Arizona Department of Veterans’ Services, in partnership with the Veterans Affairs Medical Centers, will team up to hold the Arizona Military/Veteran Women’s Health & Knowledge Fair. The fair is designed as a family-friendly event and offered in both Phoenix and Tucson at the VA Hospital on Sept. 27 from 9 a.m. - 2 p.m. The fair will focus on health services, skill building, benefits and resources. "As the Director of the Arizona Department of Veterans Services, it’s important to make sure that all of Arizona’s veterans are served," said Ted Vogt in his message on the Arizona Department of Veterans' Services website. For more information and to register for the Tucson Health & Knowledge Fair please click here. Rio Salado College is committed to helping active duty service members, veterans and their families through its Veterans Affairs office and the East Valley Veterans Education Center – by providing educational outreach, college advisement and other specialized services-- at no cost. Visit www.riosalado.edu/veteran or call 480-517-8153 for more details about Rio Salado’s Veteran’s Affairs office. Visit www.evvec.org or call 480-384-9850 for more details about the EVVEC.